Well if things couldn’t get more bizarre, UFC 223 certainly makes the grade. Seeing as Conor was busy doing nothing but avoiding fighting, or is that doing everything but fighting? Dana finally had to put on the show for the belt. 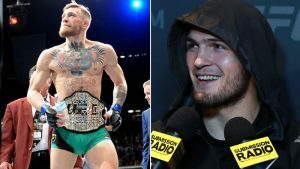 But avoided as best he could about stripping Conor of the belt and whether this was a title fight between Khabib and Ferguson, because he had tried to stage this fight before on multiple occasions only to have it fall out of sight. So he waited. He wanted to make sure, this time, the fight actually happened before admitting that Conor would be stripped. And as fate would have it Ferguson had to pull out. Then to the rescue Holloway stepped up, it seemed as though UFC 223 was saved. But then disaster struck again and Holloway was pulled as being medically unfit to fight. You would think Dana would have had that checked prior to making the match up, but hindsight always is 20 20. So now comes in Laquinta, and UFC becomes the great headliner that no one cares about. 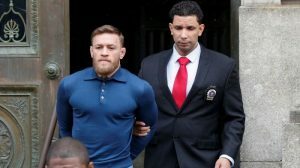 To top everything off Conor, and his little gang that included Lobov, who apparently had a run in with Khabib in a hallway, flew in from Ireland to confront a bunch of UFC 223 fighters on a bus, most of whom had nothing to do with the earlier incident, and started throwing things at the bus in some wild frenzy of awkward stupidity. In which some fighters were injured by flying glass. Suffice it to say the UFC, and Dana White as it’s primary spokesperson, has lost pretty much all credibility as a ‘ professional ‘ sport. It’s more of the nature of a three ring circus.